The first place I confessed my secret was in my journal, a new spiral notebook, the summer of 1967. DearMy Imaginary Friend: When I grow up and become a writer, I am going to write Historical Fiction books. I confided in my journal what I didn’t dare tell my best friend or my mother. Later, I revealed in my journal that I was afraid I was a failure after a few attempts to start my first novel at age 13. I was devastated when my imagination went blank trying to write a girl’s life a hundred years before. Oh well, I decided, while I wait to become a writer, I’d tell my diary everything. I wrote about the first night after school got out for the summer. My best friend and I camped out in the back yard in a tent. We felt daring playing strip crazy eights but it was cold and we decided we’d only take off our sweaters and socks. We woke up at five a.m. cold and hungry. Oh, no, we worried, we were sure my parents had locked the door. We felt like desperate survivors as we gobbled the only food in the rusty basement fridge, watermelon and chocolate sauce, which we were sure kept us from starving. We felt so silly hours later when we discovered the front door had been unlocked all the time. That afternoon I wrote in my journal about how my summer began. So much happens when we keep a journal. As a shy teen I had to have a place where my secret self could live, where I could express my private thoughts, where I could let out my feelings and thoughts. What I didn’t know was that I was developing a skill to write fluidly and express myself with agility. I was also giving myself a place of refuge not knowing more intense times were ahead of me. I didn’t realize that journaling would keep my desire to be a writer alive while I developed skills to capture the vivid details of life. Writing about my teenage sleepover locked that twenty-four hours into my memory, good not only for laughing about years later with my old best friend, but journaling would anchor countless moments into my memory. 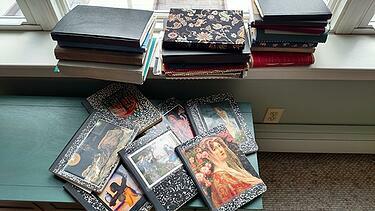 The next spring, my journal was a place to escape when a churning intensity of feeling welled up in me. One moment, I was happy wearing a Mexican embroidered dress enjoying Easter brunch with neighbors; in the next moment, I couldn’t stand chatting about deviled eggs and the weather. All in a flash I realized we were standing on a little planet spinning in a vast universe. How could people act like all was well? I was watching my life from a telescope and a microscope at the same time; everything had changed. Writing the struggle in my journal was the only thing that helped. My words felt like a secret vow to tell my truth. As a teenager, my journals became more detailed as I felt an urgent need to record my life. I kept scraps of paper and a pen in my pocket to jot down ideas so I wouldn’t forget them until I had time to write. My journal from 1969 shows a culture in flux and how these changes were seeping into our lives. While I was sewing mod outfits on my Singer sewing machine, and my best friend and I got tipsy on champagne at a wedding, I also wrote about getting moody and sarcastic. My father was yelling more and more at my younger brother about his long hair, and about how he hated all the dirty ragged hippies in the city. That summer I was outgrowing the easy conversations with my best friend. I was becoming lonely without realizing it, hungering for a deeper connection. My journal would be my place to escape to, whispering things to myself I didn’t dare say out loud. I didn’t realize yet my family was splitting apart. I didn’t realize the radical cultural changes of the 60s were escalating into the turbulent 70s. Writing gave me a place to record what was changing in race relations, at anti-war marches, with the radical changes in women’s relationships with men and the world. I practiced speaking up in my journal before I could speak out in the world. After I left home, journaling helped me heal from the pain of childhood abuse. In these new radical times, my journal was my companion, an anchor and comfort. In the decades to come, I would remember when I needed to write. 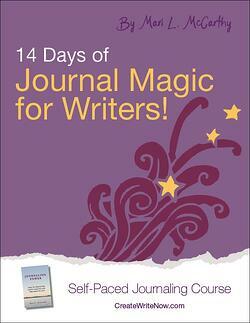 I’d open a journal and begin to write until I could remember my own voice. Those countless hours of writing also built the skills so I could become the writer I dreamed of as a girl. 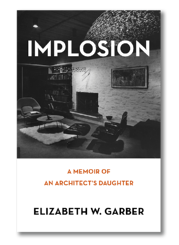 Implosion: Memoir of an Architect’s Daughter delves into the life of visionary architect, Woodie Garber, his adored daughter, Elizabeth, their family, and a mirror glass dormitory he designed for the University of Cincinnati campus. The family was caught in a collision of radical social change, modernism, and madness in the turbulent 1960s in Ohio. The tower dorm, known for out of control partying and an epidemic of arson, was only occupied for eleven years, and would be dynamited into rubble, the largest implosion in the US. 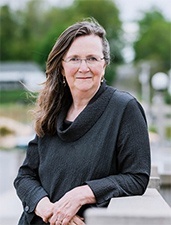 Elizabeth W. Garber is the author of Implosion: A Memoir of an Architect’s Daughter (2018) and three books of poetry, True Affections (2012), Listening Inside the Dance (2005) Pierced by the Seasons (2004), and Maine (Island Time) (2013), a collaboration of her poetry and essays with paintings and photographs of Michael Weymouth. Three of her poems have been read on NPR on The Writer’s Almanac. She was awarded writing fellowships at Virginia Center for Creative Arts and Jentel Artist Residency Program in Wyoming. She has maintained a private practice as an acupuncturist for over thirty years in mid-coast Maine, where she raised her family. https://elizabethgarber.com/. If you want to learn how a journaling habit can help you tackle life's challenges, please download the free eBook, The Journaling Guide to Manage The Stress and Strains of Life.